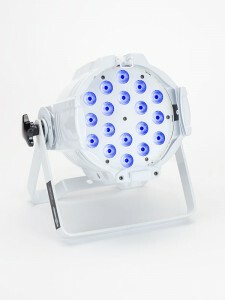 A powerful, well�]rounded stage light, the elektraLite 1018AI is ready to bring rich vibrant color at a professional level. At the heart of the elektraLite 1018AI are eighteen powerful 12�]watt 6�]in�]1 LED�fs, consisting of a red, green, blue, white, amber, and indigo component. The 6�]in�]1 LED uses diffraction lensing, eliminating �grainbow�h color spots which are typical when individual LED�fs are exposed in lighting a cyc or similar background. The elektraLite 1018AI is designed to deliver rich, vibrant colors you expect from an LED fixture, while still providing true, brilliant, tunable white. By mixing color internally, the 1018AI�fs sophisticated diffraction lensing system provide true, blended, single�]color output. Because of this, the white is tunable with the amber and white LED components, and the color range for pastel and deep blues and purples is intensified with the indigo component. A user�]friendly onboard control interface allows for multiple control options including master/slave, DMX, including RGB, strobe, and console�]free static operation. The 1018AI has 5�]pin XLR DMX connectors (both in and thru). With a convenient, strong double�]yoke included standard, mounting options are limitless.